Tiny, Frantic, Stronger. Jeff Latosik. Insomniac Press. London, Ontario. 2010. Today's book of poetry has been the humble recipient of many, many volumes of poetry since we opened our door. Most of our books, almost all, come from publishers. And bless their cotton socks, each and every one of them. Today's book of poetry is always on the hunt for new (to us) poetry titles. Next week we are meeting up with an American friend who is bringing us three boxes of new poetry from Vermont. Recently, in Montreal, Today's book of poetry stopped at our favourite bookstore, The Word, near McGill, and picked up five or six poetry titles. A new (to us) Sharon Olds. That could read "Her Supreme Poetryness Sharon Olds". A first edition A.M. Klein, Hitleriad, and another David Mamet poetry title. Sometimes individuals, poets, send us their books and on occasion there are a number of poetry friends who have been kind enough to leave piles of poetry on our step. Today's Jeff Latosik came to us in just such a fashion. One morning, not too long ago, our side door step was pyramided with poetry, a gift from an old friend. There was a small herd of Charles Tomlinson, a fabulous book by K.I. Press called Pale Red Footprints. It didn't stop there, but low and behold, in walked Jeff Latosik and kicked me in the knee. Not a bad kick, but an "I'm here, let's get started" kick. Latosik damn near knocked us off of our poetry feet. Jeff Latosik is, apparently, some kind of poetry monster. He is a brilliant Dr. Frankenstein and Tiny, Frantic, Stronger is his beautiful monster, built to run roughshod on our little poetry village. THIS is a book that Today's book of poetry wants you to track down. Tiny, Frantic, Stronger is exactly the type of book Today's book of poetry was started for. of the part that held their afternoon together. and the crowd can make a dome of their cheering. crooked, two by two, these kids are living long division. and every lit up window is a difficult board game. the fold-out chairs that won't fold back. she climbed a fence and in how many places her wrist broke. And the planes seem closer, the stars, countable. Today's book of poetry's copy of Tiny, Frantic, Stronger came to us in near-perfect condition. Not so much now. You may have noticed a wee break in our scheduled programing. Today's book of poetry has been sidetracked with other business for a bit. During that time we were carrying old Latosik around with us. We spilled water on Tiny, we spilled wine on Frantic, and Stronger got push pulled into folded pages somewhere in the luggage between Peterborough and Montreal. It doesn't matter a bean. Today's book of poetry is back in the saddle, sorry for the break, we missed you all. Latosik clearly has a good grasp of the big picture, as you are reading Tiny, Frantic, Stronger your confidence grows with every page. You become willing to follow Latosik wherever his amusement takes him. And, Latosik can be as hilarious as he wants as he slides in there dark and ominous. Today's book of poetry likes a little tension in our humour. Night pushed their windows closer. They slouched more. It felt good to give up posture. that involved a series of miniature doors. or when the game might come to an end. I imagined my life differently, she said. I am the tallest man in Toronto. until something delicate fell from a table. There was inhaling the price tags from beautiful clothes. You have too many tiny apartments, she said. there was something huge and complete. After our long break there were some poetry hounds around the office this morning chomping at the bit for a howling, a reading, and Tiny, Frantic, Stronger was the tonic needed to get every engine running. Our morning read was a delight, the enthusiasm around the room was contagious. This eight year-old book is as good as we have seen in a while, and it was new to us. Latosik connects you to his work by taking you with him as he hop-scotches his way through these intimate moments, these carnival laughs. These poems will remind you why you like poetry. Tiny, Frantic, Stronger is a stunner. Press your hands against the ceiling. pushing its way through a hairline crack. Step down slowly. Break a window. then try to stuff it all back in the roll. Develop. or that direction is an equally preposterous notion. until it feels new, like an old shirt whose sleeves you roll up. your arms around a full-grown oak. Throw a fistful of marbles across a field. Try to get inside a shoebox. During our brief hiatus Today's book of poetry had an opportunity to mull over the whole thing, poetry, the world, our place in it. Books like Tiny, Frantic, Stronger help so much. Books like these pull you out of your own little world, even if it is for the briefest of moments. Thank you Jeff Latosik. It was a bit like discovering Fred Neil, who knew that was out there? Today's book of poetry wants to take this opportunity for a few shout-outs. Christopher McPherson, Stuart Ross, David Clewell, Ward Maxwell, Dag Straumsvag, David Whyte, Pearl Pirie, Alexander Monker, Alexander Michaud, Pistol, Otis and of course the ever sweet K. Today's book of poetry would also like to send a shout out to Rob McLennan, ever industrious and generous. Jeff Latosik’s third book of poetry, Dreampad, will be released in 2018 from McClelland & Stewart. He lives in Toronto. 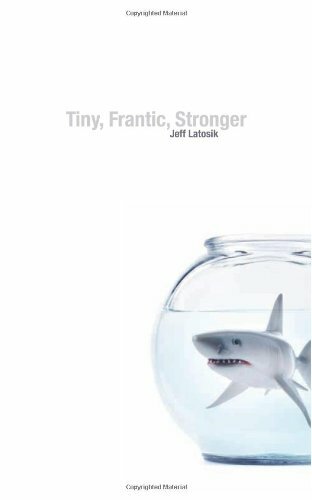 Jeff Latosik's Tiny, Frantic, Stronger is infested with cockroaches, silverfish, with and sharp turns. Watch where you're going: some of his line broaden into fields; others are trap doors. These poems are chock-full of playful, irreverent humour, but beneath that humour is an insistent search for understanding. As strange and delightfully surprising as these poems often are, they are also intimate and vulnerable — a rare achievement in a debut collection. Jeff Latosik's is a fresh new voice.